The full-size replica of the future James Webb Space Telescope. A five-layer parasol will protect the telescope from the sun and keep its temperature close to absolute zero. This will make the telescope’s instruments exquisitely sensitive to light coming from the early universe, which is so redshifted to be mostly in the infrared spectrum. The object of desire of astronomers worldwide was on display on the National Mall for a few days here in Washington. It was a full-size replica of the James Webb Space Telescope, which some time in the mid-2010s should take its rightful place as heir to the Hubble telescope’s throne. I went to take pictures yesterday afternoon, and to get a feeling of the telescope’s sheer size. In space, telescopes can afford round-the clock dark skies unhindered by atmospheric disturbances or cloud cover. But deploying large telescopes in space is enormously expensive — current estimates put the Webb’s cost at $3.5 billion — and size is limited by the cargo capacity of current rockets. The Webb will get around that in part by folding out its parts only after reaching its orbit. The Webb’s primary mirror, made of 18 hexagonal segments, will span 6.5 meters, compared to the Hubble’s 2.4. The Webb will still be smaller than the largest ground-based telescopes, whose primary mirrors are now as wide as 10 meters. 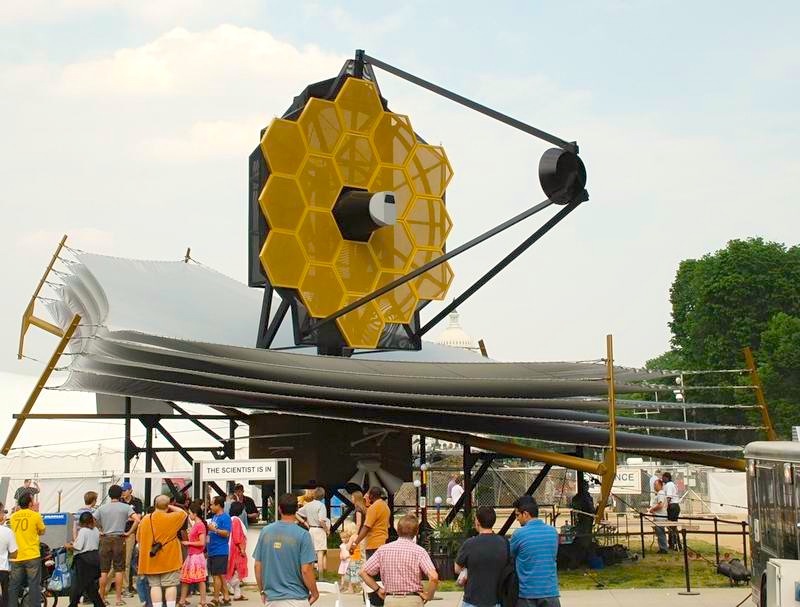 But according to Northrup Grumman, principal contractor for the NASA-led mission and the sponsor of the Mall event, the Webb telescope will be able to resolve objects 400 times fainter than those visible with any current instrument.